Finding the perfect wedding dress tends to land at the very top of a bride’s list of priorities – and truth be told, that’s perfectly natural. After all, you only get married once – and feeling amazing in your own skin is important. What are some of the top wedding dress trends for 2018? 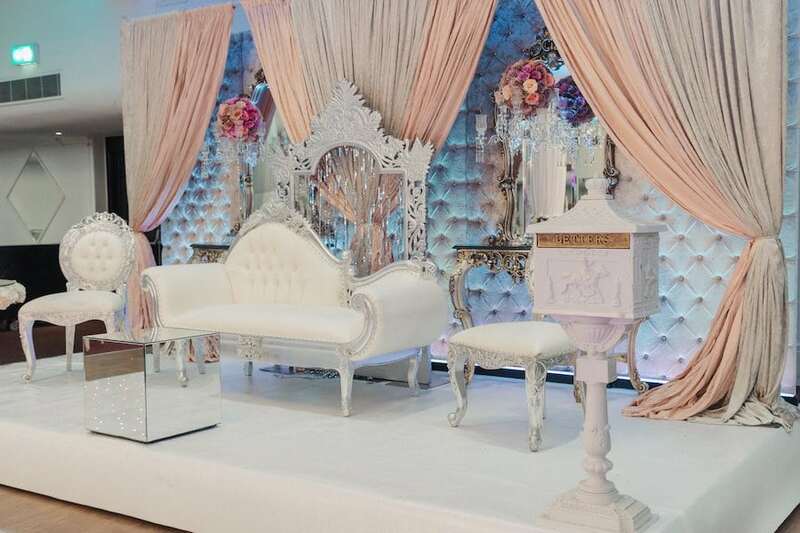 We have gathered some of them right below – so read below if you are looking for inspiration before you start shopping around for the ideal wedding gown. High-low wedding dresses. Cannot decide between a short dress and a long one? Why not both? This year’s wedding gown trends have brought back the high-low designs – and they are more stunning than ever. From dresses that alternate between a delicate tea length to a long length to gowns that alternate between very short and very long, there’s something for everyone! Our Star Gown from our Starlight collection features a fitted short romper with an overskirt, and lace mini shorts covered with a tulle peek a boo. From our new 2018 collection, Dancing Up the Aisle, our Cha Cha Gown features a lace skirt covered with a tulle peek a boo over skirt. Detachable sleeves. Off-the-shoulder dresses will continue to be very popular in 2018 – and with the detachable sleeve trend, they are taken even further. These sleeves come in all shapes, sizes and fabrics, and make even the simplest dress into a fashion statement in its own right – they are dramatic, beautiful, and ultra-feminine! So many of our gowns feature detachable sleeves, it’s like two gowns in one. From our New Collection, Merengue features detachable sleeves as does our Superior Gown from our Spiritual Design Collection. Capes. Planning a wedding in fall or winter? 2018’s wedding gown trends will not allow you to freeze! With a variety of capes (long and short, made from fabrics more or less thick and more or less revealing), you will be able to actually feel comfortable even in lower temperatures. Plus, let’s face it: these capes really do add a dash of glamor and mystery to pretty much any wedding dress! Many of our gowns feature detachable capes to add versatility to your wedding day look! Regardless of what dress you may choose to wear, remember this: wedding trends are here to inspire you. Beyond anything, YOU should be the one feeling amazing in your own wedding dress and skin – so take these trends and build your own bridal style. You will simply SHINE! If you are like most brides out there, you want your wedding dress to leave everyone in awe. You want to look flawless, you want this dress to embrace everything you are and you want it to be downright perfect. The question is what are some things to keep in mind when you go wedding dress shopping? We have some tips for you – so read on and find out more. Do your homework. Run a bit of research and see what types of dresses you like the most. 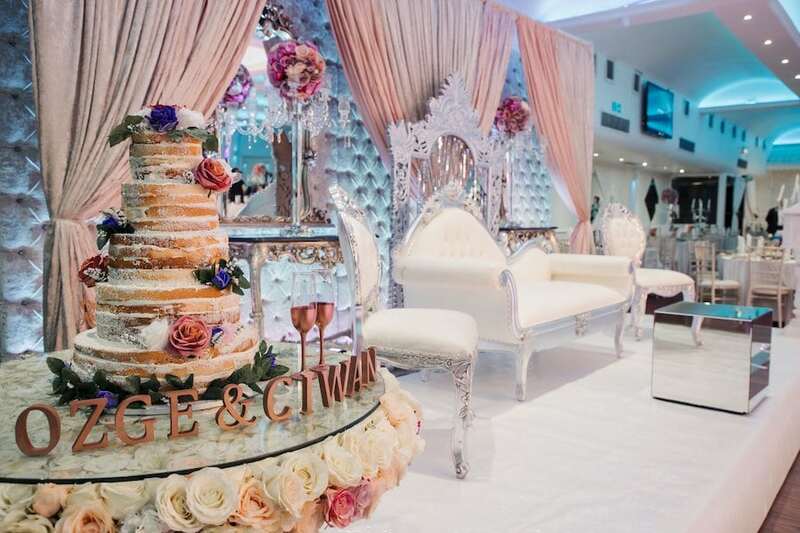 Regardless of whether you visit one bridal boutique or ten of them, knowing what you are searching for will give your bridal stylist a better idea of the designs he or she could show you. Be open-minded. You have no idea how many brides end up purchasing the kind of dress they would have never pictured themselves wearing! Your bridal stylist will be able to offer genuine advice on the kind of gowns that look best on you – so even if you’re not particularly keen in the beginning, trying out their suggestions might actually lead you to find the one. Be patient. Finding the right wedding gown doesn’t just happen. It usually takes a bit of trial and error, a bit of shopping around. Be patient with yourself. Give yourself the time to find the dress that makes you forget about all other dresses. Yes, you will just know when you try on the perfect wedding dress for you. Bring your closest with you. Our advice is to avoid a very large wedding dress shopping entourage because it can get confusing. Your mom, a best friend, maybe another bridesmaid – try to keep the entourage smaller, so that you get valuable advice from people who actually know you very well. Sample sales might be a great deal. Most bridal boutiques organize sample sales at the beginning of the year, so try to attend these, especially if you know you wear sizes 8 to 12 (the dresses in these sample sales usually come in these sizes). You can save a lot of money this way and still get a really luxurious wedding gown design. Remember, nobody should tell you what type of dress to wear on your wedding day – so do choose the gown that feels best for you, not for the wedding trends, for someone else, or for what you think a bride should wear! 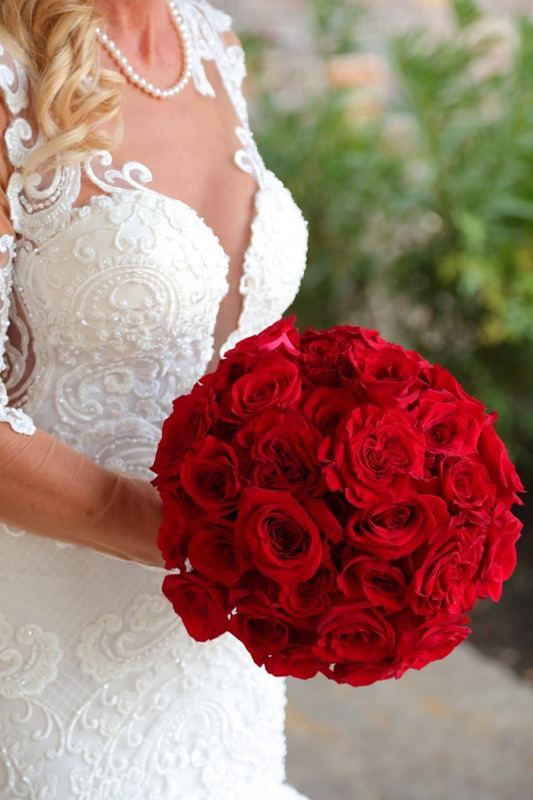 Regal reds and pristine whites, have you ever seen a more elegant color combination? 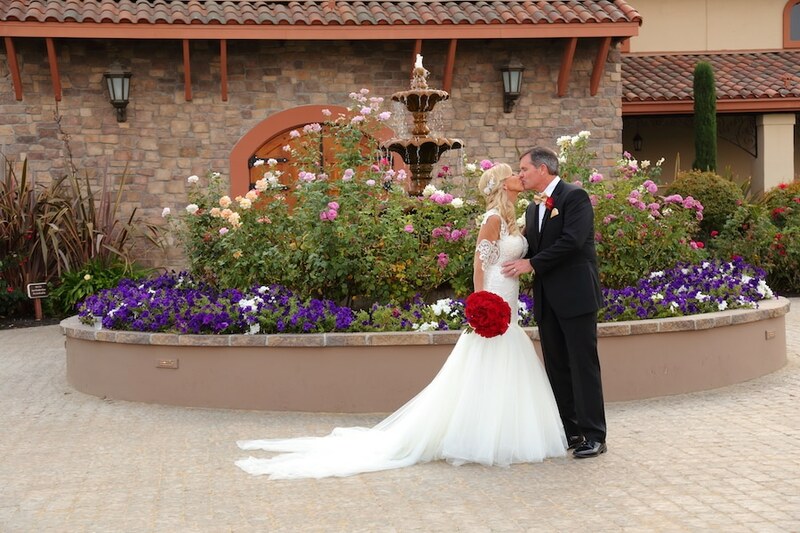 Every element of Lucy and Doug’s red rose inspired wedding was sweet and sophisticated, with a classy color palette that paired seamlessly with our custom Devine Gown. 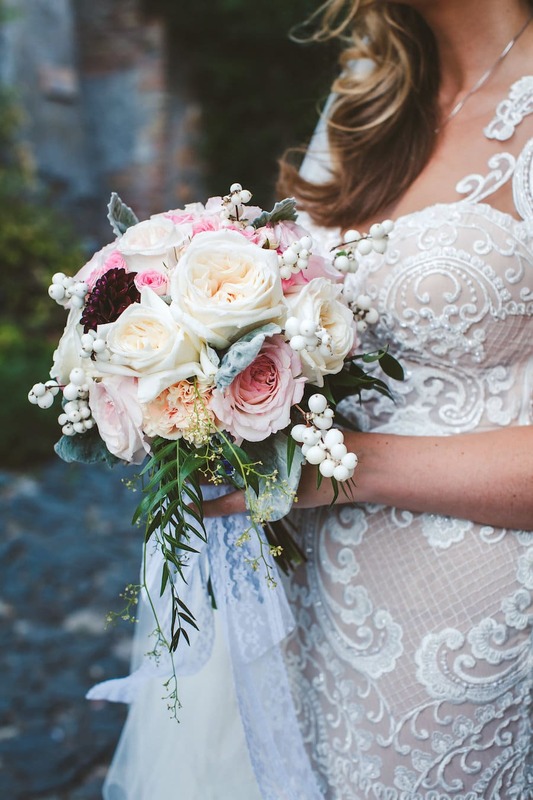 To be inspired by our beautiful bride and all the blissful details of her wedding day, keep reading! 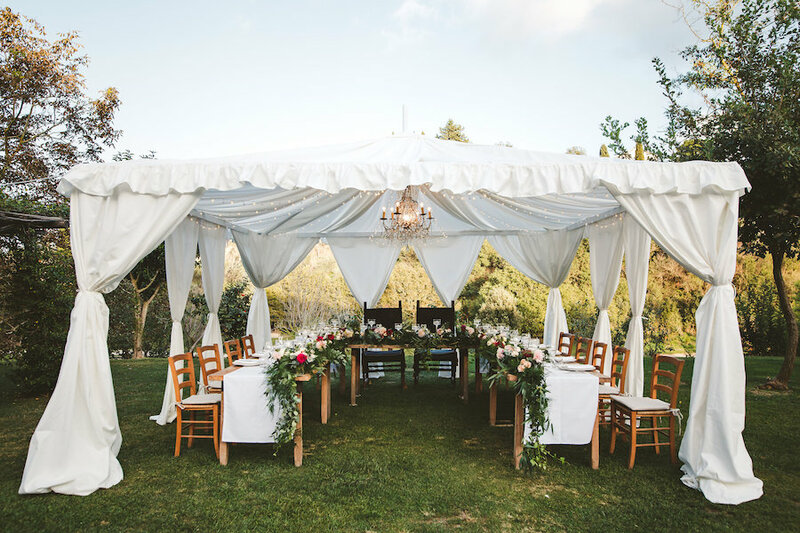 Tucked away in the rolling hills of Livermore Wine Country, Casa Real at Ruby Hill could not be a better venue for this posh yet private wedding ceremony. 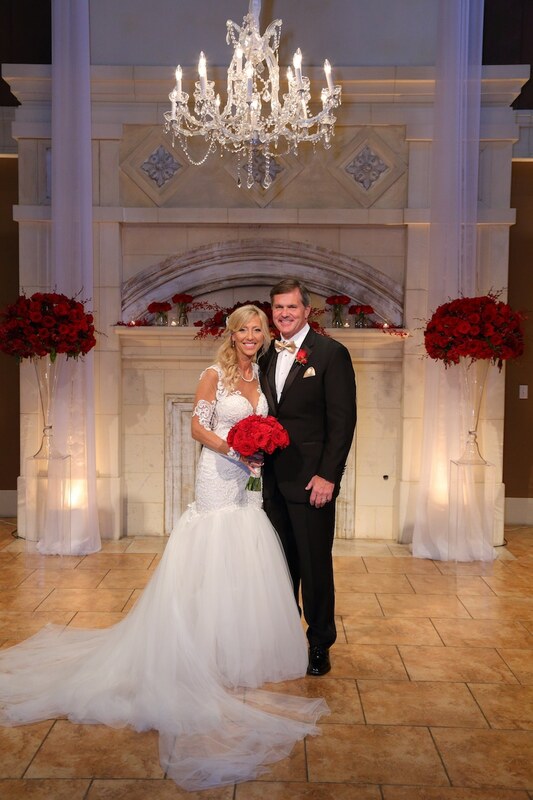 With romantic rooms and an elegant wine tasting offerings, the venue was the perfect fit for this classic couple to tie the knot. Fitted to perfection in her customized couture gown, bride Lucy was bubbling with anticipation as she prepared for her big day in the breathtaking bridal suite of the Casa Real. The fitted bodice of her mermaid style “Devine” gown, fit perfectly with the delicate pearl details that draped her open back with darling detail. 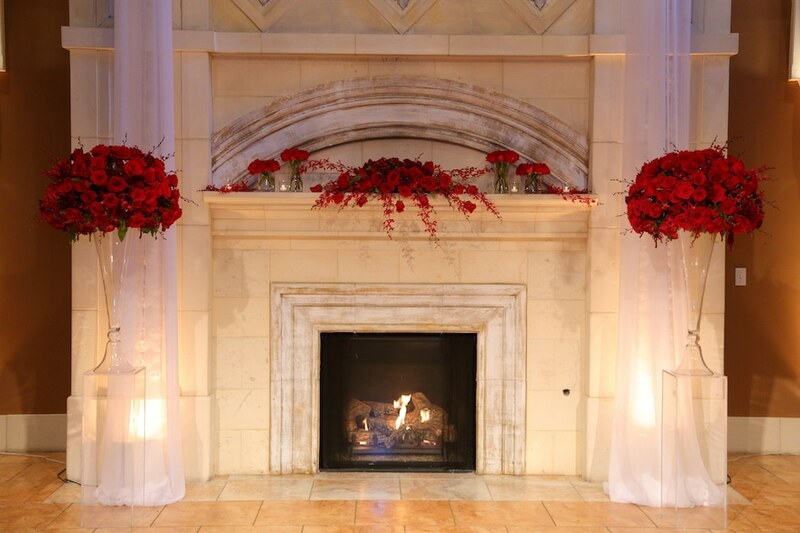 With a bouquet of lush roses red by Nicole Ha Designs in hand, Lucy stood beaming at the Amber Room entrance, ready before making her way to the altar. She began her descent down the rose petal-lined aisle, towards her grinning groom, where the two would tie the knot by the floral-framed fireplace. Surrounded by a handful of close family and friends, the couple exchanged vows while Lori Rittinger Photography captured every sweet smile and sentiment. After the ceremony, guests made their way to the venue’s gorgeous Grand Salon, where they celebrated with dinner, drinks, and dancing long into the night. 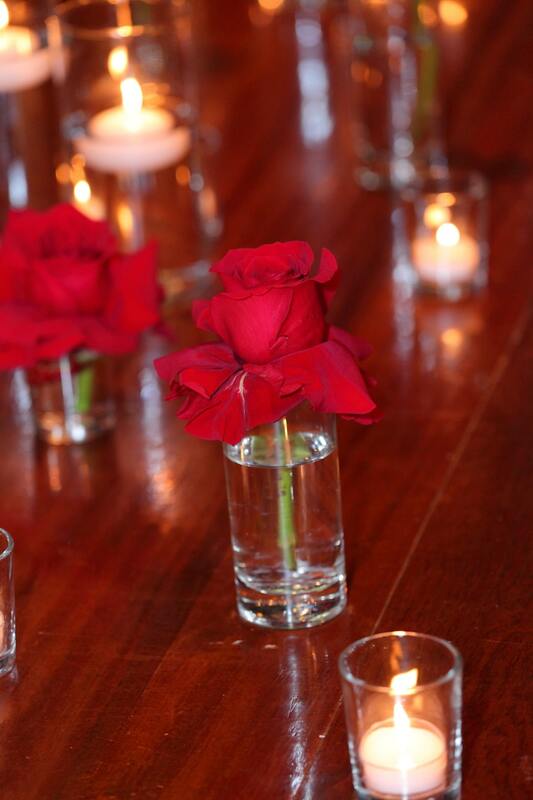 From the details to the design, we were excited to contribute to such an elegant red rose inspired wedding with one of our custom couture gowns. To see a peek of the glamorous gallery, keep scrolling! 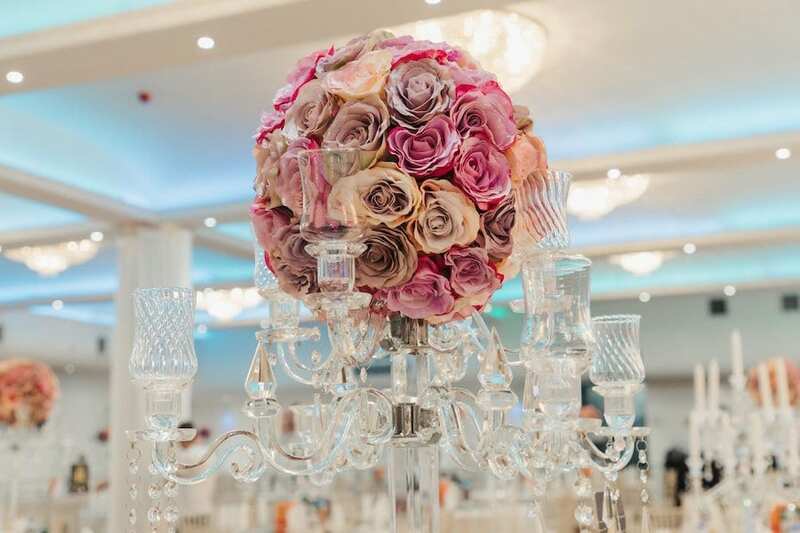 Set in the heart of England, this Lavish London wedding was absolutely breathtaking. 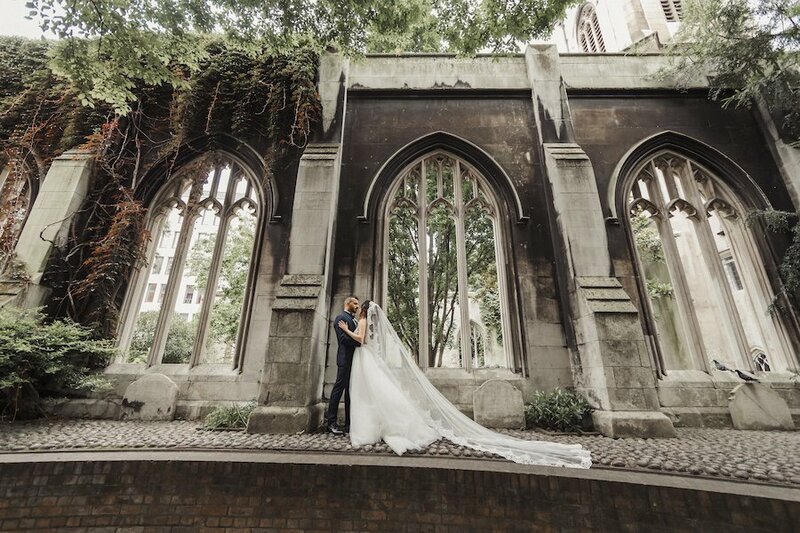 From the gorgeous gothic architecture and lavish lacy gown, to the vibrant greenery and London cityscape, we loved every element and were honored to contribute! To see all the beautiful details, keep scrolling! The scene is set: the mysterious stone arches of the St. Dunstan church ruins tower high, as lush greenery drapes over the regal frame. Bride Ozge, astonishing as could be, made her way out of the leafy shadows to exchange a tender first look with her husband-to-be. 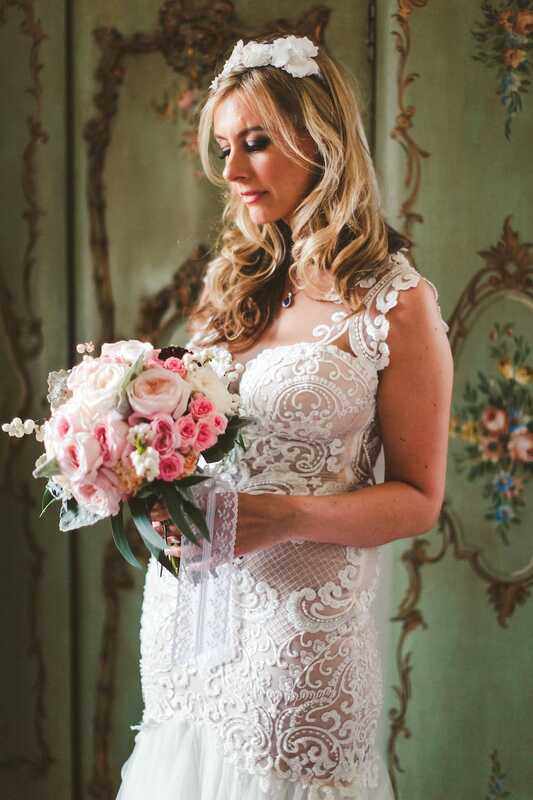 Fitted to perfection in her custom couture Naama & Anat “Goddess” wedding gown, Ogze was a vision in lace. With a fitted sheath cut, V neckline, fitted lace bodice, detachable tulle overskirt and illusion back, the signature gown was as timeless and elegant as the venue in which they found themselves. With hair pinned back flawlessly by Choppy Cut and a sweeping veil framing her face, the bride-to-be exchanged sweet sentiments and lingering looks with her groom just hours before the wedding. Photographer Coban Weddings captured the calm moment before the wedding day chaos in beautiful photographs that will last a lifetime! After the first look photoshoot, Ozge and Ciwan ventured into the hustle and bustle of downtown London, where they posed for snapshots in the center of their city. 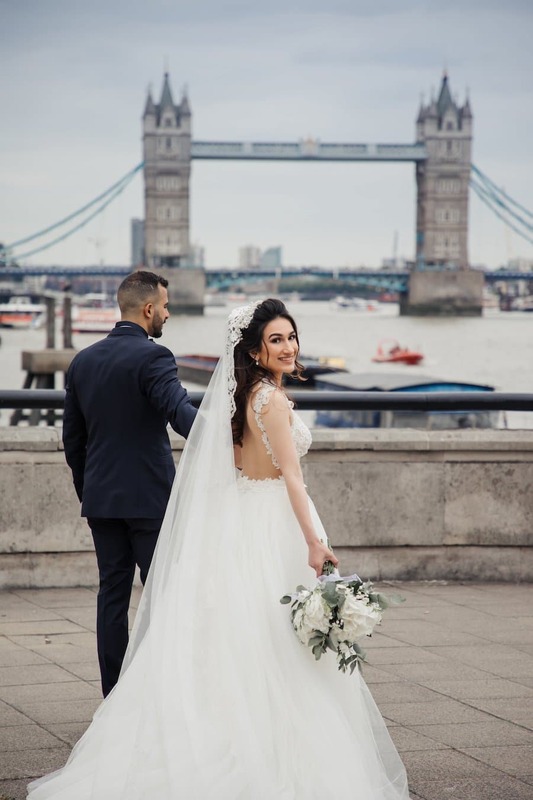 With iconic English elements all around them and the London Bridge setting the backdrop, the couple effortlessly made memories they will forever cherish. Once they tied the knot, the newlyweds celebrated with family and friends and danced the night away in a lavish reception that everyone enjoyed. 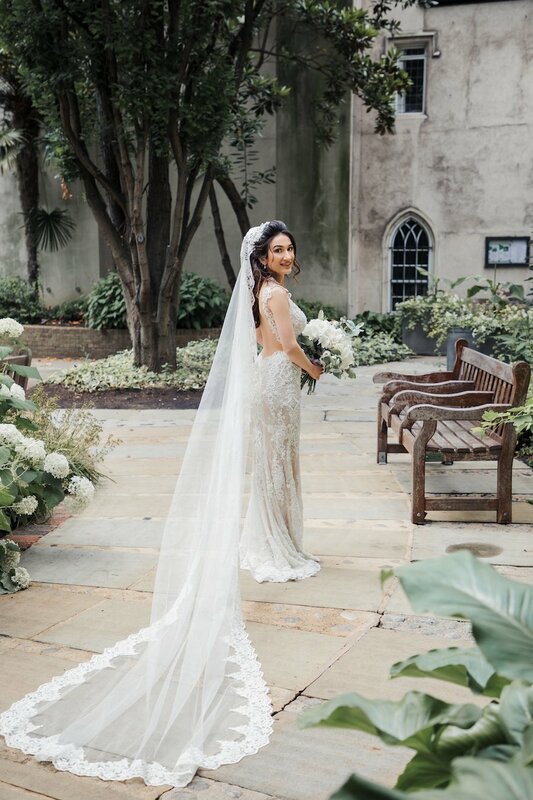 From the lovely historic church venue, to the lacy custom gown, every detail of Ozge and Ciwan’s Lavish London Wedding was a dream and we were thankful to provide such an important element. 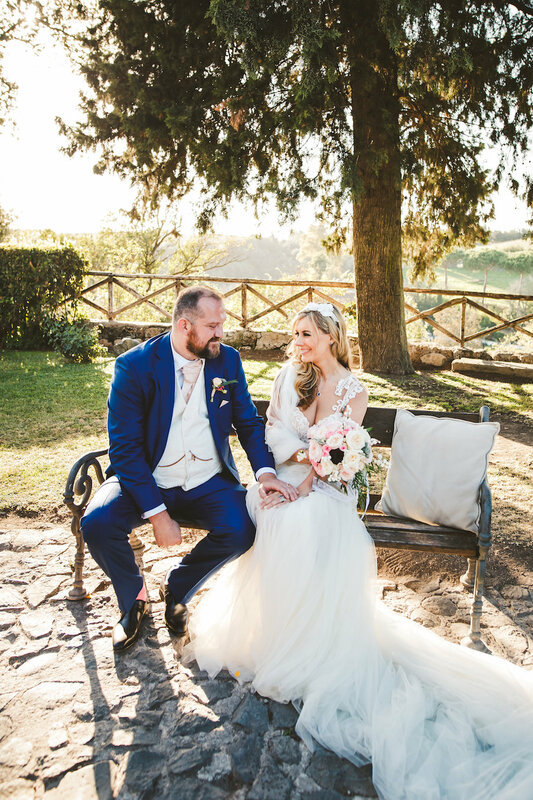 Sweet simple pink meets regal navy blue in a vibrant Italian countryside wedding that exudes elegance. The seamless sophistication of the wedding, which incorporated modern elements and pops of color provided the picture perfect canvas for one of our most popular gowns, “Diva”. We contributed to this iconic Italian countryside wedding by provided the beautiful bride-to-be with the wedding gown of her dreams, and we can’t wait to share the details with you. To get a glimpse into the big day, keep reading! Church bells were ringing in the Italian countryside and the wedding day had finally arrived. Hidden away in the bridal suite, bride-to-be Clodagh sipped champagne and giggled with her best girlfriends as hair and makeup artist Janita Helova put the finishing touches on her wedding day look. Dolled up in hot pink robes, Clodagh’s bridesmaids buttoned up her “Diva” couture gown with care. Fitted to perfection with a flawless mermaid silhouette, the lace-covered wedding gown set a tone of absolute elegance for the whole affair. From the detailed straps to the wispy tulle-covered train and every element in between, the gown was stunning and complimented the gorgeous bride with grace. 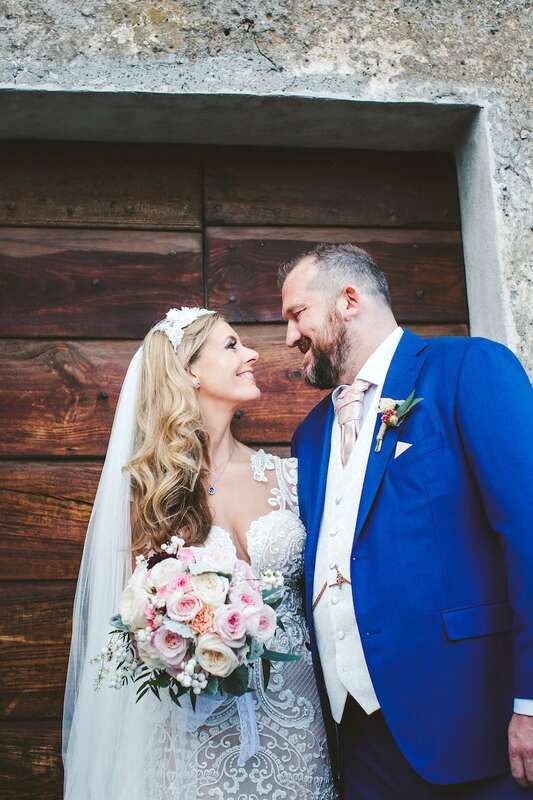 With a delicate pink bouquet by I Fiori de Donatella & Giuliano in hand, Clodagh made her way down the stone villa steps to meet her groom at the altar. Framed by a floral-covered arch that dripped in hues of green and pink, the couple exchanged vows and sealed the ceremony with a kiss. Photographer Peggy Picot captured every frame, while videographer Celli Fotografi filmed a gorgeous highlights reel that the couple will forever cherish. 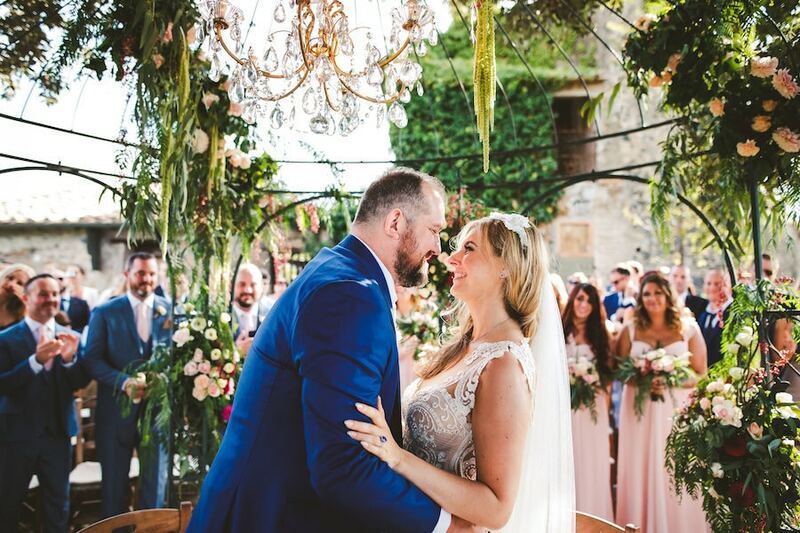 After Clodagh and David tied the knot, family and friends gathered in the courtyard for dinner, dancing, and drinks which lasted long into the night. 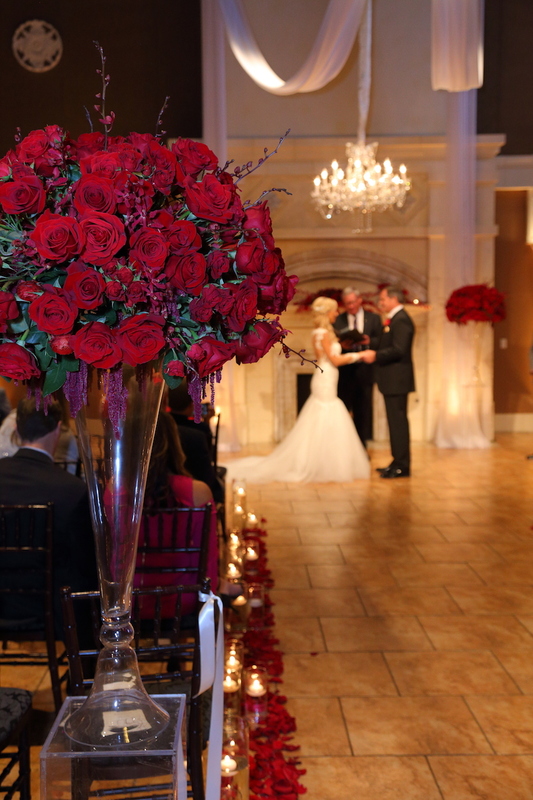 From the elegant Italian influences to the captivating color scheme, we loved being a part of this stunning ceremony.